I’m an old-fashioned kind of girl who finds a method that works and sticks to it. 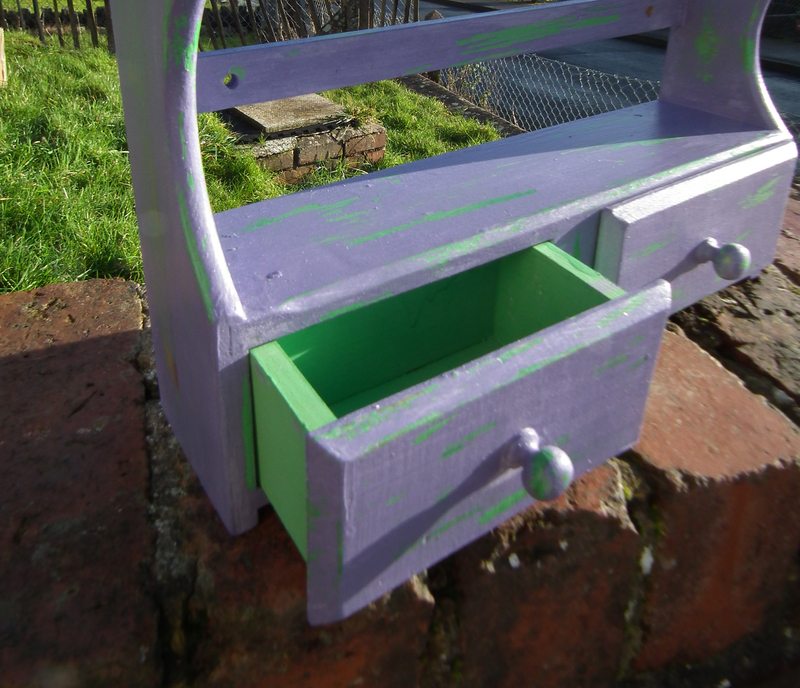 That means I can spend hours, days even, gently rubbing back paint to get just the right distressed finish required. Recently I’ve been thinking that there must be an easier way? I believe in doing the job right but if there’s a way to do it right and quickly shouldn’t I be using it? Sure enough there are lots of ways people distress their furniture I hadn’t even considered so in the next few weeks I’m going to be trying them out (or some at least) and sharing my findings with you, dear reader. This first method uses something most of us keep in the pantry… vinegar. 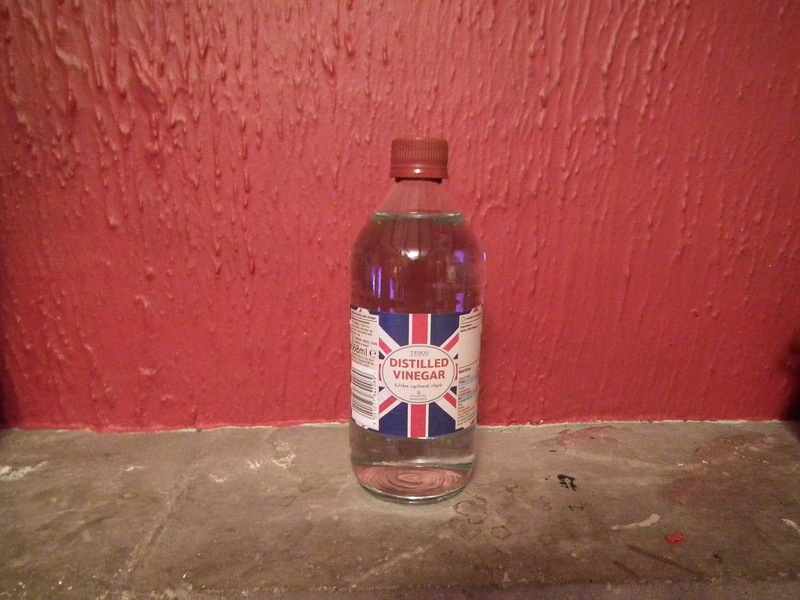 I decided to opt for distilled or white vinegar as I didn’t want it to stain the paint in any way. Obviously I didn’t have any distilled vinegar in my store cupboard so that meant a trip to town and another hour out of my day! 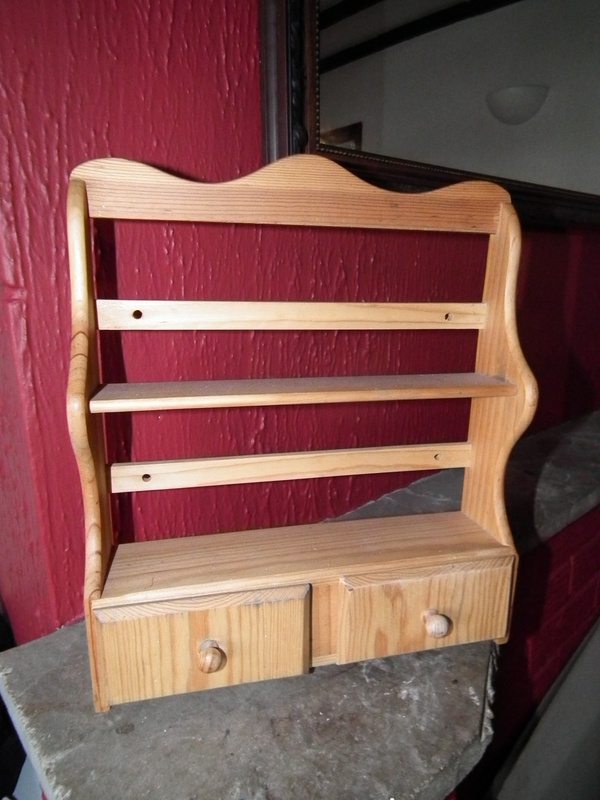 Anyway I already had this cute little shelf unit (spice rack maybe?) that I found in a charity shop a few weeks back. 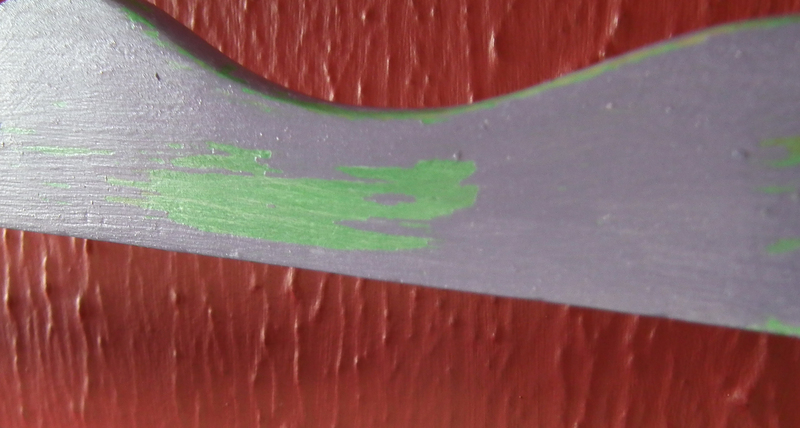 It is pretty featureless so will rely on having a good paint effect to give it some oomph. 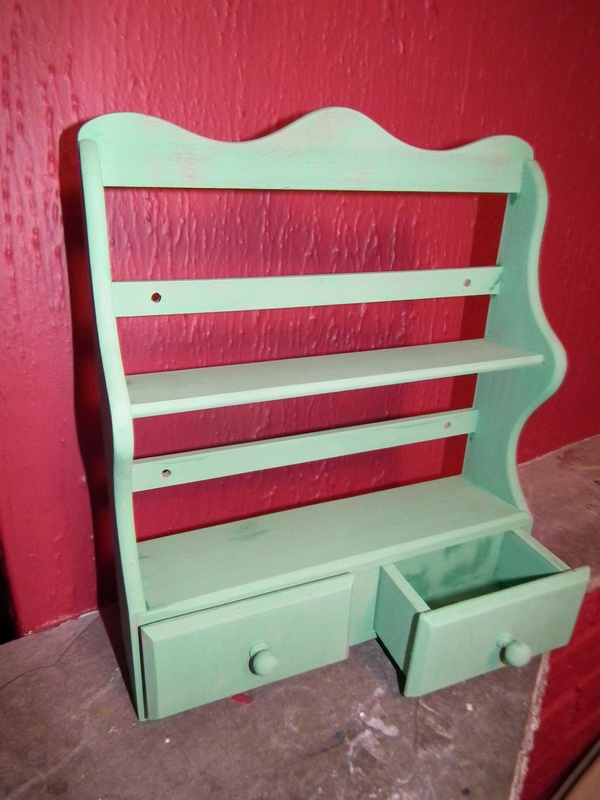 I started with a quick coat of Annie Sloan’s Antibes Green, as I had some left over from an earlier project. As always with this colour I was tempted to stop there, but then I’d have nothing to share with you, so I gave it a quick wax using Rusto-leum clear furniture wax. Then it got 2 coats of my own deep lavender (okay, I’ve got to come up with some cool names for my paints) and left it to dry thoroughly. Once dry, I just dipped my microfiber cloth in the vinegar and wiped it over an area. Nothing happened. I rubbed a bit harder. Nothing happened. Then, as I was showing Mark how ineffective it was, a huge streak of the lavender rubbed clean off! This big chunk wiped off in one go! 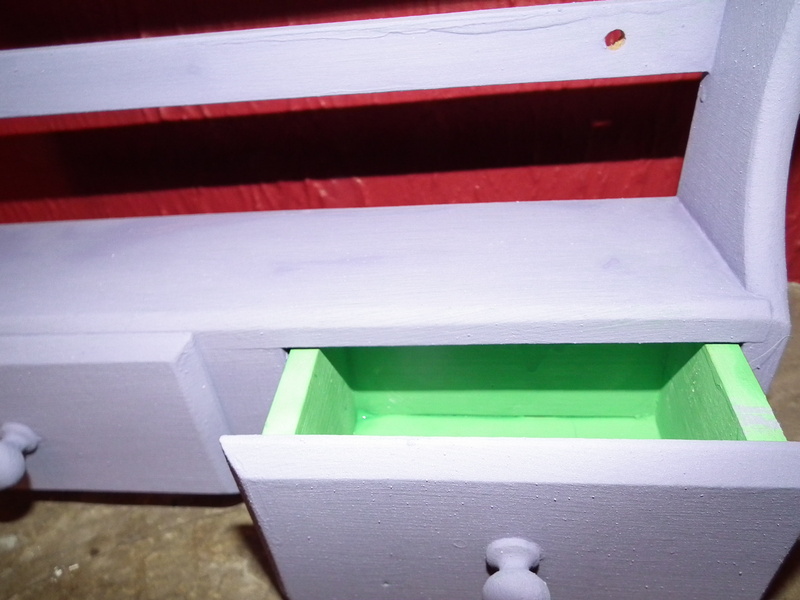 I think the knack is to almost soak the paint in vinegar and give it a second to soak in. I’m really glad I took the time to wax after the green or I think it would have wiped off at the same time – the wax was just enough of a barrier to protect it. Once I got the hang of it, it was so easy! I wouldn’t want to use it on everything because you just don’t have the same control as you do sanding by hand, but if you want a beat up, rustic look then this is great. You need a gentle touch until you get used to it! In the interests of science (or maybe just because I’m still a wee bit sceptical) I’m going to try a similar experiment using plain water and another using something like lemon juice so I’ll keep you updated – be sure to follow us so you don’t miss a thing! Tune in next week to see how I got on using Vaseline to distress a mirror in my lounge, and please let me know if you’ve heard of a method of distressing you’d like me to try, and review! Well I keep hinting at exciting new changes going on with us, and promising to tell all ‘soon’, well it’s about time I put you out of your misery and let you know what we’re up to! Firstly I am enjoying writing this blog so much we are going to commit our URL (that’s web address to us non-techy peeps) to it instead of a traditional web site. I just have to get BT (British Telecom to my non UK readers) to give me access to my account so I can redirect. Don’t worry, I will write again once I have all the details and I really hope you will follow us over to our new home. Our next big thing is a re-launch of the shop. It had started to lose its way and become more of a second-hand store than somewhere to find great furniture that had belonged to somebody once before. Mark and I have talked lots over the Christmas holidays and have decided that we want to concentrate more on the painted and refurbished, the fun and funky. We will have to keep a little of the other stuff because people are buying it, but there is going to be a lot more of my influence in there and a lot less Poole Pottery! That being said, the shop is still Mark’s territory while I stay firmly behind the scenes. 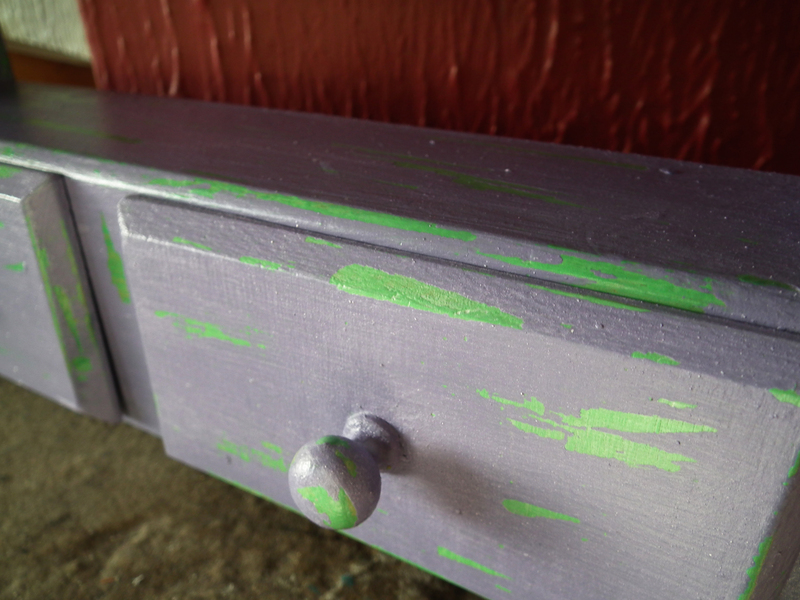 As part of this re-launch we have decided to start selling a few extra bits and bobs… mouldings for furniture, handles and knobs and (most exciting for me) our own range of chalk paints!!! I’ve been experimenting with paints for a few months now and think I’m happy with my recipe. The paints go on well, sand back well, and keep well. I have a small range of colours and can afford to sell them at around £10 for half a litre (I’ve still to do the math to make sure we aren’t losing or being greedy). 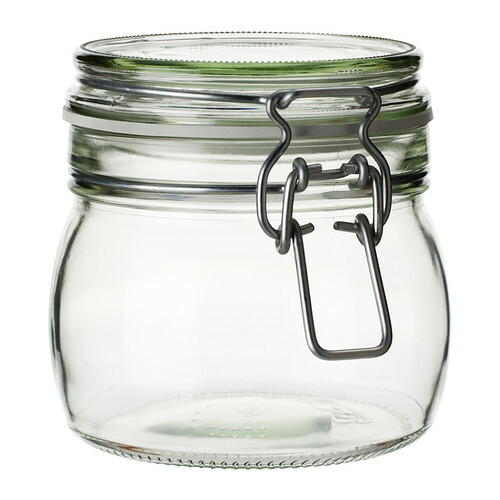 I have been working on the packaging and decided to go for glass Kilner or Mason style jars for a couple of reasons. First off I like the way you can see how much paint you have left and exactly what colour it is at a glance, I like that the paint washes right off them giving you a useful container to reuse and, lastly, I like the way they look stacked up on my shelf! 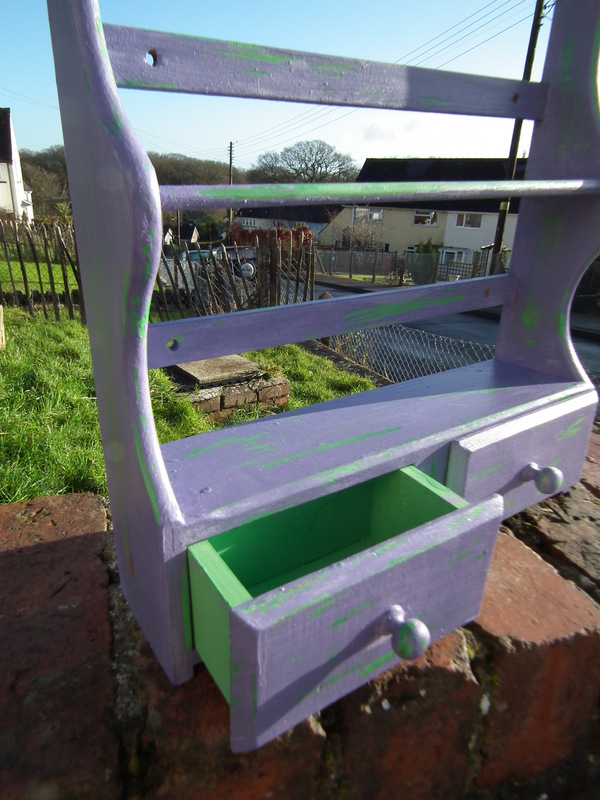 I’ve given them their own name – The Little French Paint Company – as I will be selling them independently of Big Red Barn and thought that some of the other shops I’ll be approaching might not be comfortable advertising our shop, being the competition and all that! If you are wondering Mark’s surname is French and, if I ever get around to planning our wedding, one day mine will be too. I can also use it on other things I make as it’s so generic – The Little French Soap co, The little French Candle co… get it? 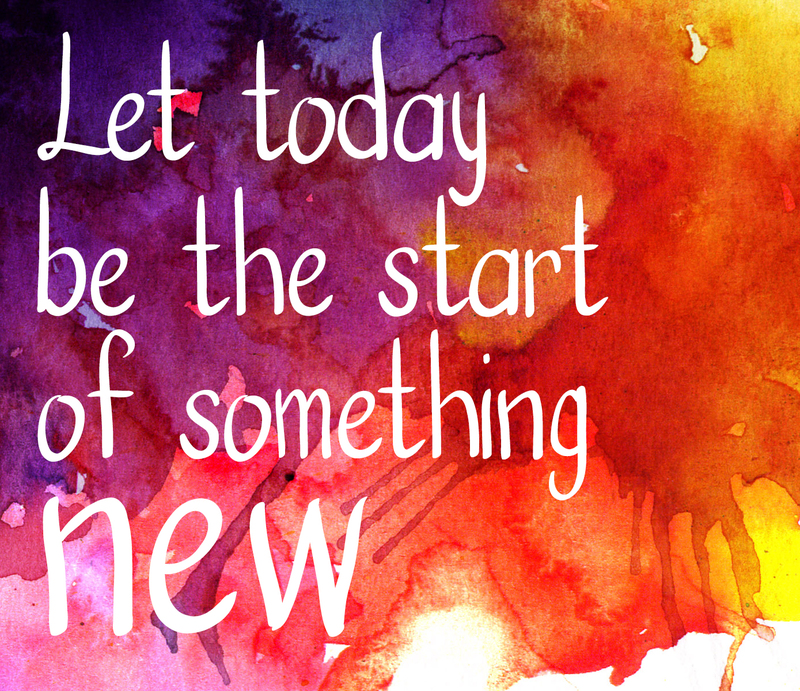 What are your big plans for 2015? Are you branching out or launching a new product? Perhaps you are planning a home makeover you’d like to share? I love getting your comments and will always reply to any questions. I first published this tutorial on a now defunct craft blog but thought that it was worth bringing over here. I know that primarily this is a DIY blog but when the weather is cold you don’t always want to be in a cold workshop but your fingers still itch to do something! This soap sock is a neat way to make your soap stretch a little further while gently exfoliating your skin. You can knit them up in half an hour and use whatever yarn you have to hand. I’m told that felting wool is great because it actually shrinks with the soap as you use it, but my particular favourite is using string! Not the horrid nylon stuff but the old fashioned 100% cotton twine. It’s a little strange, at first, knitting with something that has no ‘give’ whatsoever but it’s a simple project so doesn’t cause too many headaches! A pair of knitting needles – I use 8mm but play around to find what works best with your yarn. A bar of soap – whatever you like best! Start by casting on in your preferred style. I’ve always gone for the ‘Thumb‘ method myself! You’ll need to cast on enough stitches to cover 3 sides of your soap (2 short and one wide) – I have cast on 12 with this chunky string and 8mm needles. Just remember to cast on an even number of stitches. Now this next stage could sound daunting if you’ve never tried double knitting but it’s unbelievably simple and so quick to do you will be a pro in no time. Knit your first stitch. Then slip your next stitch as if to purl – this means put your needle as if you are going to purl the stitch and then just slip it over. Carry on with knit one, slip one until you reach the end of the row. You will always finish on a slipped stitch. Once you have worked a few rows like this you will be able to feel 2 sides to your knitting and actually be able to separate them a little! Turn your work around and repeat until your ‘sock’ is long enough to hold your bar of soap. Always start on a knit stitch and finish on a slip! Once your sock is long enough you’ve reached the scary part! Leave a long tail – about 1.5 meters – and slip your work off your needle. Yes, I said slip it right off without casting off. Just be brave and pull the needle out! Now gently prize your work open (like opening a bag of crisps!) and carefully thread your long tail through each of your stitches, starting with the last knitted stitch. Be careful not to drop any stitches as you thread your tail through them! This is the hardest part! Once you have caught every stitch on your tail you can turn it inside out, pop your bar of soap inside and pull the tail to tighten around the top of the bar. Now the reason for the extra long tail… We’re going to make a handle to hang your soap from so it can dry out and not go all squishy between uses! 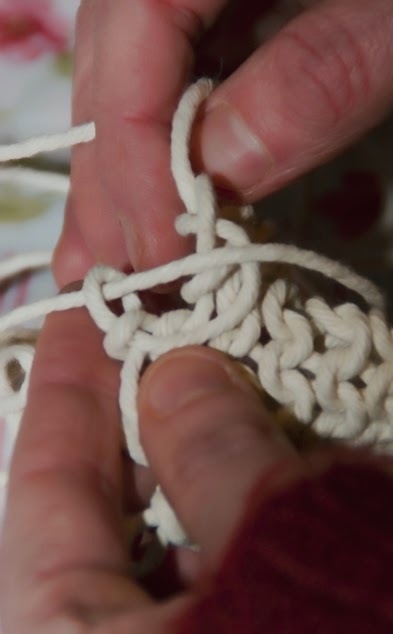 Make a slip knot in the yarn, as close to the sock as you can get it. Form a loop and tuck it into the noose. Make another loop and tuck it into the previous loop. Keep repeating. When the chain is long enough, lock it by passing the end through the final loop. See here for animated instructions. Tie the loop to form a handle and you’re done! Please let us know what you think, and feel free to ask questions or show us your finished soap socks!